Bcg.perspective interviewed the chairman of Nokia and F-Secure Risto Siilasmaa. Referred to as the savior of Nokia by the Finnish press, Siilasmaa was one of the key figures in the sale of the Devices and Services business to Microsoft back in 2013, and the leader of Nokia’s transformation in a programmable world. Under Risto and the current leadership, Nokia’s enterprise value exploded, growing about 20 times since 2012, and the market value has more then doubled. The video-interview and the transcript can be found here. Down below you can find a few answers to the most interesting questions about the Rebirth of Nokia. You became chairman in May 2012. One could call that the low point in the very long history of Nokia. 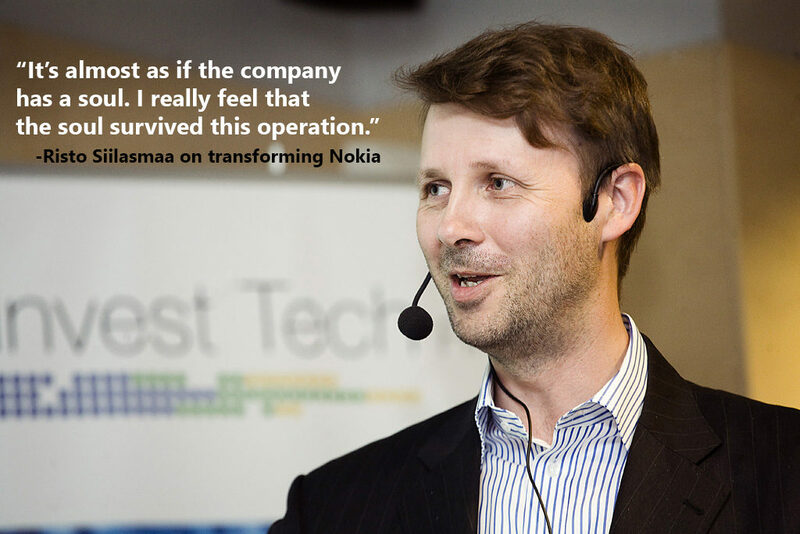 Could you describe why you decided to accept that challenging position, and what Nokia was like at that time? We were planning the biggest layoffs in the company’s 150-year history. Our revenues declined by 26% in the quarter when I was appointed chairman. Our net operating losses were over $2 billion during the first six months of that year. I could continue that long list of dark tidings. We understood the challenge, and I decided to do things differently. In order to change the leadership and board practices of Nokia in this very difficult time, I laid out golden rules for our board work. Of course, I discussed those with the board members, and we approved them together after making some changes to my original proposal. I’ll mention three rules out of seven. The first one was assume the best of intentions from others. We want to be honest about bad news. One of my favorite sayings is that bad news is good news, good news is no news, and no news is bad news. The second was that we would be a data-driven board and we would work harder than normal or average boards do. The third rule out of the seven is that any meeting where we don’t laugh out loud is a complete failure. We need to have fun, especially when we deal with the most difficult and most emotional decisions, like selling the handset business to Microsoft. Since May 2012, when you became chairman, Nokia’s enterprise value has grown by approximately 20 times. There were many external moves during that period. What were the internal moves that made this transformation work? If you take the point of view of looking at our employee base currently, we have 106,000 employees, but over 99% of them did not carry a Nokia badge just three years ago. It has been a complete removal of engines, the cabin, and the wings in midflight of an airplane and reassembling the airplane to look very different while in midflight. How have you been able to preserve Nokia as Nokia, even though everybody has essentially changed their jobs? It’s almost as if the company has a soul. I really feel that the soul survived this operation. You can follow Risto on Twitter @rsiilasmaa. Leak: New Nokia 6 is TA-1054, while TA-1005, 1009 and 1042 are Nokia 9? !